When I was originally asked if I'd be interested in trying Tasty Bite, a brand that sells quick-to-prepare Asian and Indian vegetarian/vegan meals, I said yes. Not because it sounded tasty (it didn't), but because I'm not one to turn down something for free. They lost me at vegetarian and double lost me at microwavable packaged foods. Turns out I'm a snob for no good reason, though, because these suckers are good! Normally I turn my nose up at vegetarian food because I'm a carnivore at heart, and I can't imagine being satisfied with just vegetables. I especially hate food imitating other food, so no tofu for me. But these dishes aren't imitating anything. They offer Indian and Asian entrees, noodles and rice dishes that tasted surprisingly similar to what you'd get at a restaurant, and I was satisfied even without meat. I rarely eat packaged foods because they're all too often stuffed with all sorts of gross ingredients like high fructose corn syrup or unpronounceable additives. But that's not at all the case with the all-natural Tasty Bite line. Want Channa Masala, an Indian Chickpea dish? It's made with just Onions, Water, Chickpeas, Tomatoes, Sunflower Oil, Coriander, Salt, Spices, Chilies, Bay Leaf, Turmeric. Just like you'd do at home if you had way more time on your hands. When it came to taste, I had seriously low expectations. So low that I let my sister try one of the packs first, Madras Lentils. When she started raving about them and asking where she could get more, I realized I might be missing out on something. 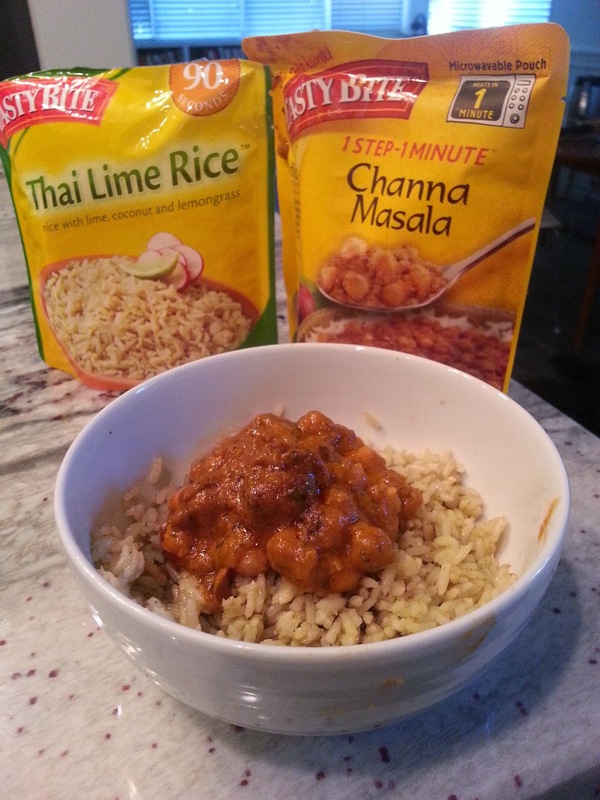 So one night when I couldn't figure out what to make, I threw together the Thai Lime Rice and the Channa Masala not even caring that it was Asian and Indian. 90 seconds later, I was eating a very flavorful dish, no effort required. Can't beat that after a long day at work! I usually avoid convenience eating because it leads to pigging out on pizza or settling for sandwiches for dinner, but these bad boys were tasty and felt like I was eating "real" food instead of processed junk. On another night, the Mr. checked out the Asian Toasted Sesame Noodles and had the same reaction. You can find more options here and a smaller selection at local Costcos and Whole Foods. So I stand corrected, and I would highly recommend Tasty Bite to anyone who enjoys Asian and Indian flavors but doesn't always have time to whip up something from scratch or head to a restaurant.